And I don't mean in all the ways that it's awesome to be an old man. I got a new job at a company I'd never heard of before that is a vendor for recreational systems. In other words, they sell and install playgrounds and water slides, among other things. Sounds great, right? Well... it's kind of what I imagine Hell might be like. Don't get me wrong, the job is interesting. I'm learning all kinds of stuff about contracting and estimating, my boss is young and pretty friendly, and the pay is actually better than I was making at my last job after being there for two years. Plus there's the whole "the economy is dying, the sky is falling, you should be glad you even HAVE a job" jive talk that everyone keeps saying. Here's why this job bites. I spend eight hours a day looking at pictures of little kids running around with huge smiles on their faces, playing on playgrounds that I could never have dreamed of when I was a kid. 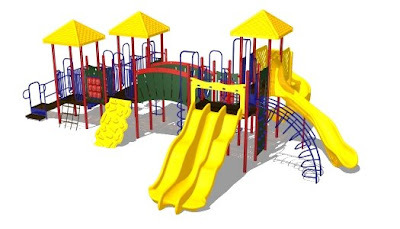 They've got "climbing adventures," rope swinging attachments, tunnels, slides, the works. I mean, some of this stuff looks like they're trying to recreate an Indiana Jones movie. Don't even get me started on the water activities. They've got hoses, sprinklers, shower systems, slides - all the cool gizmos at water parks except for the really big stuff. And everyone in the pictures is laughing and splashing and playing along, having a gay old time. And then there's me, wishing I was a kid again, or at least wishing I was on the playground, swinging and climbing and having a ball. Instead, I'm going to bed at 10 pm so I can be awake at 7 am to go sit at a desk in an 8' x 12' room and be tortured all day long. And here's the icing on the cake: with the five minutes of my thirty minute lunch break when I wasn't eating, I found out there's shuffleboard in the break room. My own little personal Hell.